← I’ll be home for Christmas.. Pelf is right. With so many bloggers posting their personal summaries of what happened throughout the year 2007, it really saves a lot of time blog-hopping because I can simply devour what their blog was all about in a one-leg-kick reading action. In fact, I have also learnt some new things which I didn’t know about certain bloggers by reading their year-end recaps. So now, as the year 2007 draws to a close, I too would like to reflect on what has happened in the year that was…’twas a giddy one at times, made all the more giddier with all the new friendships I have made through blogging. I began the year by getting a domain of my own. After several months being a blogspot blogger on Ethan’s blog, I decided that I love writing so much I wanted a personal blog of my own too. Hence the birth of Giddy Tigers in the blogosphere… at the same time, I also migrated Ethan’s blog to its own subdomain as well. And I’ve never looked back since. Blogging has proven to be an avenue for me to express my thoughts and feelings and also say nonsensical things without anyone telling me not to. I truly enjoyed writing every post, absolutely adored blog-hopping and of course, leaving my two or three cents worth of comments on other blogs, unashamedly chupping along the way. As if juggling two blogs was not too mind-blogging to fathom, something possessed me to kickstart a third blog, solely dedicated to shopping. Without a doubt, my blogging responsibilities have increased tremendously with three *babies* to care for now. It wasn’t all a bed of roses for me though, no sireee… for the first time ever in my life, I put my life on the line and played paintball! Okay, that was an exaggeration, but hey, when that paint pallet hit my head, and I saw the red paint all over my hands, I almost fainted. This year saw me acquiring a new toy too, the hot spanking Nokia N73. It has brought me countless hours of pleasure and thrills of photo-snapping and video-recording, all because of the disease which still, to this day, plagues me.. Will the year 2008 present me with a DSLR instead? Hehe….time can only tell. I also did many an interesting tag this year, a somewhat controversial one being one where I had to put myself in hubbs’ shoes and pretend to be my own critique. Certainly didn’t know I could write so many annoying things about myself! Heh. Very unusual of me, being an optimist and all… I did have a couple of self-reflection moments too, moments where I paused to think about the whole big picture of life. Or moments when things just weren’t going my way, and I felt really really down in the doldrums. These have certainly made me stronger and taught me perseverance. Of course, life is never complete without food. Sometimes I wonder if I do indeed live to eat. Be it the authentic original Old Town white coffee in Ipoh, or homecooked meals, the past year has been an exceptional culinary experience worth savoring. In retrospect, I did fulfill my resolution to cook more often though. Well, sorta. My favorite memories were of me cooking the claypot chicken rice and the Sarawak Laksa, oh…and who could forget that assam fish curry we had for Merdeka too? In July, we made a very enjoyable family trip to Singapore, where we had a blast visiting the zoo, the Underwaterworld, shopping and yes, of course eating goody stuff there too. Made a few trips to KL also, a very memorable one being the one we had during the Raya break. Too bad I couldn’t make it when my brother’s song was performed during the recent MRSC finals though, but I heard it was a blast! Well, my infected ear has recovered nicely, so I can listen to his song in a crystal clear manner. Thanks to Facebook, 2007 saw me reuniting, albeit virtually, with several old classmates and acquaintances. Ah, old petty squabbles were forgotten as I found it liberating to be able to communicate with them miles away. And oh yes, friendships were made stronger with this social utility that certainly has a very bright and promising future ahead! Bon Année 2008 everyone! May the New Year bring you all you have ever dreamed of! 26 Responses to Buh bye 2007, hello 2008! The Giddy Tigress says: Happy New Year, Sharine! The Giddy Tigress says: Happy New Year to you too, PB! The Giddy Tigress says: Am I getting one? The Giddy Tigress says: Hear hear! Happy New Year! The Giddy Tigress says: Happy New Year, Pelf! I am so craving for some chow kuey teow after looking at that picture! Happy and Blessed 2008 to you!! The Giddy Tigress says: Blessed 2008 to you, May! The Giddy Tigress says: Yamseng! And a blessed 2008 to you! Ah, I think I need to rekindle FaceBook, otherwise will soon forfeit all my scrabulous games!! LOL… Happy New Year, Giddiest Tiger! 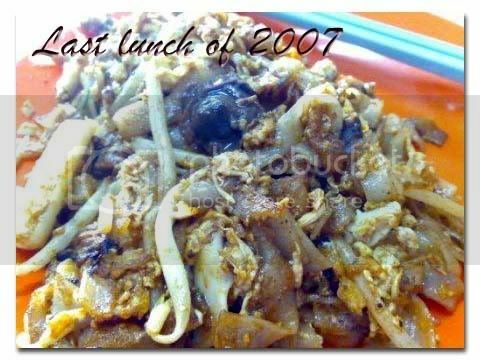 Hope for you all good things, all health, more wealth, happiness, peace, and lots of Chow Kway Teow, for 2008, and beyond.. The Giddy Tigress says: Yeah loh! I have to start nudging you already! The Giddy Tigress says: And a happy happiest new year wish to you too, Rinnah! The Giddy Tigress says: Blessed New Year to you too, Jem! The Giddy Tigress says: I wish I may I wish I might…have this wish I wish tonight…. :) Happy New Year, Chen! The Giddy Tigress says: Yes, you gotta try it out! The Giddy Tigress says: Thanks Huisia, and a blessed 2008 to you too! nice song. thanks for posting it up. i am enjoying it as i type. i wish you a great year with fulfilling moments and a purposeful journey. The Giddy Tigress says: Thanks! Happy New Year to you! Here’s to more poems! What a nice summary. Happy New Year and cheers to 2008! The Giddy Tigress says: Blessed 2008 to you! wah yr char kueh teow looks damn nice. Happy New Year! The Giddy Tigress says: Happy New Year to you too, Sasha! inspiration bank dried up. terrible to be able to write only when i am ranting or suicidal. eek. The Giddy Tigress says: Soon, I hope.. you will be able to finish the poem? hopefully after mrs manikam gives mr manikam back massage. he brings you a bag of money btw. says you’re a good gal with kind heart. he takes over santa claus. santa also backache. The Giddy Tigress says: Thanks for the tag, Wen! Pingback: Giddy Tigers » Yummy tummy mummy!